We have an orchard within a long walk from our house. 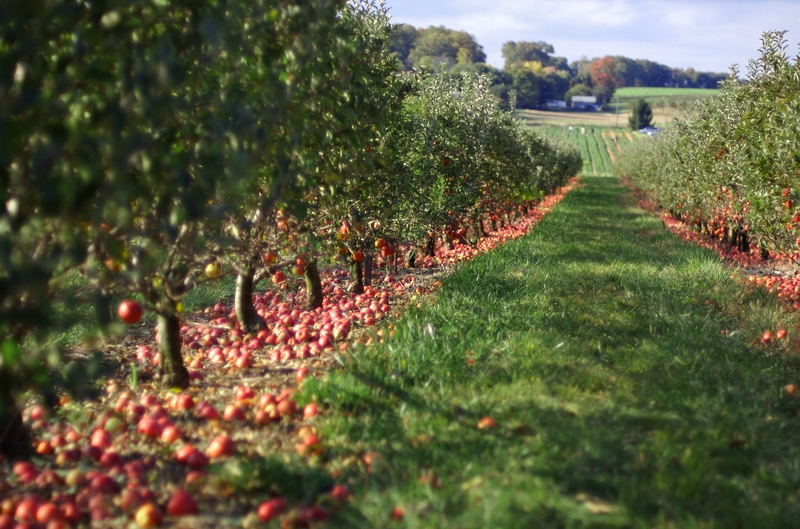 We’ve never walked to it, though, because how could we leave there without carting an abundance: bushels of apples, jugs of cider, prizes from the farm stand? Our haul wouldn’t mix well with the busy road and its narrow shoulder, although I still consider the adventure from time to time. It was at this orchard, only a few years ago, that I first saw a pear tree. I was taken by its golden aura in the early autumn sunlight. Every year they put out a PYO (pick your own) sign when the berries come in, and somehow I never make it there—in fact, I don’t recall ever picking berries from a patch. This year, I am determined to make it to blueberry harvest and emerge, stained purple, happy, and ready for a pie. I’ve been reading about harvests lately, a venture that goes so well with the spilling proliferation of summer, vines and stems laden with promise. …I walk the acre as if it were a hundred, planning the geometry for my fruit tree grid. I envision apple, pear, and plum, and of course the hardy Reliance peach. And in as many places as possible, berries: currant, gooseberry, blackberry, raspberry, and blueberry. The list of varieties reads like a children’s fairy tale, a version of “Hansel and Gretel” where visitors stumble across an Eden dripping in fruit rather than a cottage dripping in frosting. It is very much a gardener’s fantasy, one founded in the belief that life is abundant and the role of humans is to work with nature to manifest more abundance. Should have planted them anyway.